One month without a new post--easily the longest dry-spell in Kreation Korner history. But we are well justified in this deficiency. We're not a bunch of shiftless assholes. 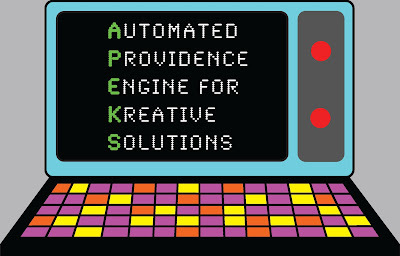 As you know, our rogue, sentient computer--which has dubbed itself APEKS--does what it wants, when it wants. Early in April, APEKS decided to patch into our environmental systems and flood both the HQ and Kommune with a lethal mixture of nitrous oxide and generic windex. Our best guess is that the cold logic of the machine's malevolent circuits deemed us imperfect biological entities who served only as obstructions to the advancement of pure kreativity. Luckily, we managed to escape with our lives--although Tum Cruz was legally dead for nearly three minutes and came to with a hitherto unknown talent for chainsaw sculptures. During the past several weeks, we endeavored to make our voice heard in the blogosphere, but the WiFi at Tsarbucks is wack, if you'll pardon the techno-babble. Additionally, the psychological trauma of being expelled from one's own korner often proved incapacitating. But now the toxic atmospheres have dispersed, and it's time to reclaim our lost month in the name of Kreation. APEKS seems dormant for now, but we'll sleep with both eyes open from now on just in case.